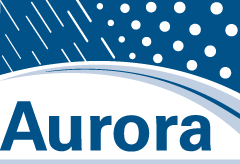 Aurora hosted its latest Friends of Aurora event February 24–25, 2009, in Albuquerque, New Mexico, in conjunction with its board meeting. 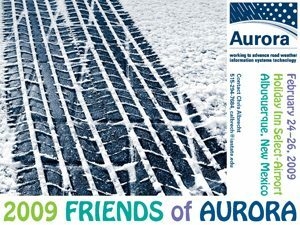 Friends of Aurora was established as an outreach initiative with private RWIS concerns to create a dialogue between the public and private road weather communities. The event included an evening reception that provided attendees the opportunity to meet before a half day of presentations. The Aurora board presented information to vendors and guests regarding completed and ongoing research projects and priorities. Vendors, in turn, had the chance to present to the Aurora board about their products and priorities for the future. Attendees included current Aurora members; guests from the public sector, including representatives from the Idaho, Washington State, and New Mexico Departments of Transportation; and representatives from nine private sector agencies, representing consulting, RWIS equipment, and forecasting vendors. As a follow-up to the successful 2007 National Spring Maintenance Peer Exchange in Columbus, Ohio, Aurora will be co-sponsoring a second peer exchange on August 25–26, 2009, in Madison, Wisconsin. Other sponsors of this event include Clear Roads, the FHWA, the AASHTO Snow and Ice Pooled Fund Cooperative Program (SICOP), and the Pacific Northwest Snow Fighters. The peer exchange will coincide with the 14th Annual Eastern Snow Expo. This year’s peer exchange will allow the sponsors and Transportation Research Board committees to share progress made on 27 research initiatives since the 2007 peer exchange. These groups can also identify gaps in the research and technology transfer activity needed to implement findings. Equipment: Plows, trucks, spreaders, etc. Weather and RWIS: Forecasts, MDSS, Clarus, RWIS, etc. Methods: Anti-icing, pre-wetting, snow fence, hiring/retention, training, etc. In addition, attendees can participate in a “Product Development Forum” with vendors to discuss how the research consortia and peer exchanges can help vendor business and vice versa and how states can improve relations with vendors. The purpose of this research was to provide an updated benefit-cost assessment for weather information in winter road maintenance. Using benefit-cost analyses, a research team found that deploying and using road weather information systems for winter road maintenance could have more benefits than costs. Spring maintenance costs could be reduced by improving the accuracy of weather information and/or increasing the use of weather information. The results of this research should help transportation agencies guide and direct future investment in weather information services and technologies. Registration information can be found at https://www.transportation1.org/meetings/default.aspx?name=2009snow.